If anyone is curious about what I think of today’s news that Alex Ferguson is to retire as Manchester United manager, what better way than this screenshot? 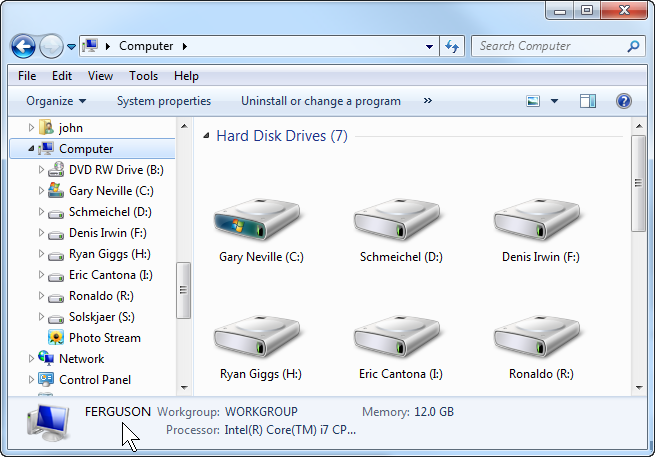 I may name my hard drives after players, but the computer’s name is Fergie…..
Maybe one day I’ll name a computer after Moyes or Mourinho? Somehow, I don’t think so. Well, for me Moyes is a decent choice, and was my preference in the few days since the annoucement. I had quite liked the thought of Mourinho, and at times favoured him, but I’m not sure he would be right for United. Mourinho obviously has great coaching ability, though perhaps any fool would win a title or two if the owner is prepared to throw a billion pounds of looted state assets at the problem (City prove that too). Yet we shouldn’t forget that when Mourinho left Chelski he’d shaped an ugly style of football based on wellying the ball up to Drogba. This Wimbledon-on-steroids game had become so turgid that even on one of the biggest nights of the club’s rather-thin history – a home game to mighty Rosenborg – their middling-size stadium was less than half full. I know Chelski are as much a way of laundering Abramovich’s money, but to his credit it’s obvious that the owner loves watching football (wish I could say that about the Glazer gnomes!) and simply wasn’t having much fun seeing the fare that his court jester was placing before him. Mourinho’s treatment of referees was also shocking even by comparison with Fergie who never caused a ref to retire from the game. Mourinho’s arrogance would be fun, for a while at least, but arrogance comes in different bottles and ours has always been the special arrogance of Best or Cantona or Ronaldo – winning with such style that the rest are unable to prevent themselves appreciating it (for example, read this Liverpool fan’s eulogy to Fergie) and with our own money and local players. So I can see as many downsides to Mourinho at Old Trafford as I can see positives. As for Moyes, at some time last year I remember thinking that Chelski had been stupid not to go for Moyes and start building something, so now I’m happy he’s got the big job – he deserves the chance.